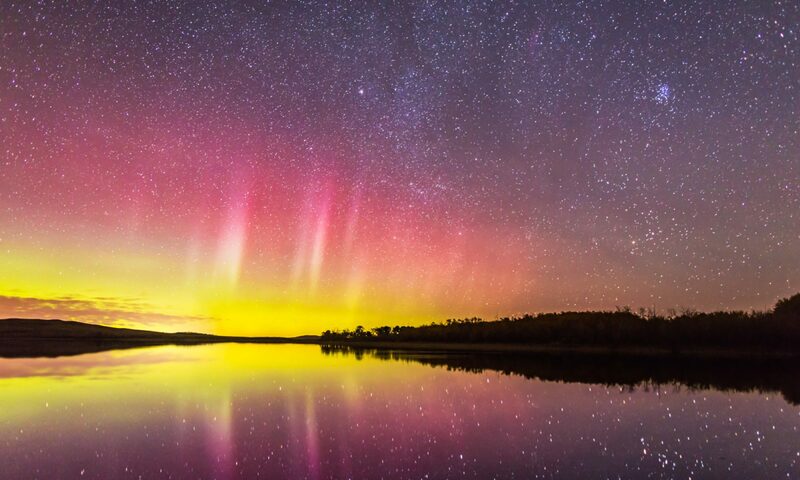 The New Year’s sky was filled with Northern Lights, a panorama of stars, and a comet at dawn. It was a busy night for stargazing as 2015 turned to 2016. A fine display of Northern Lights kicked off the celebrations, as curtains danced in the east as Orion rose (below). Toward midnight the Lights kicked up again, now with Jupiter (on the horizon) and Leo rising in the east (below). I shot hundreds of frames for time-lapse sequences, and assembled them into a short music video. Click on the buttons to enlarge it to HD. Just before midnight, while the second time-lapse was going and the aurora was still active, but before the Last Quarter Moon rose to light the sky, I shot a set of tracked images taking in the entire winter sky from horizon to well past the zenith. That image is at top. It takes in the winter sky and northern winter Milky Way, from Canis Major just above the horizon, up past Orion, then on up to Perseus and Cassiopeia at top right. 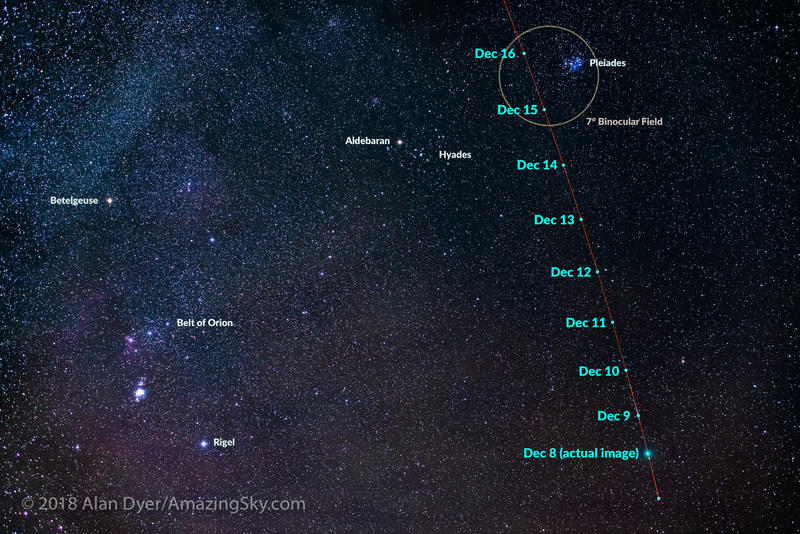 It shows how Orion and Sirius, the night sky’s brightest star, stand nearly due south at midnight on New Year’s Eve. Comet Catalina (C/2013 US10) near Arcturus in the constellation of Bootes, at pre-dawn on the morning of January 1, 2016, with the Last Quarter Moon nearby illluminating the sky. A long, faint ion tail is visible extending 2 to 3 degrees to the right while a brighter but stubby dust tail extends down to the south. Shot from home using the 200mm Canon telephoto and 1.4x extender at f/4.5 for a stack of 8 x 2-minute exposures at ISO 800 with the Canon 6D. Median combined stacked to eliminate satellite trails. The comet is slightly blurred due to its own motion in that time. The final show of the night, now before dawn on New Year’s Day 2016, was Comet Catalina sitting right next to the bright spring star Arcturus. The comet was visible in the moonlight as a fuzzy object next to brilliant Arcturus, but the photo begins to show its faint tails, just standing out in the moonlit sky. The comet will become more visible later this month once the waning Moon exits the dawn sky, as Catalina is expected to remain a nice binocular comet for most of the month as it heads high into northern sky. Happy New Year to all! Have a celestial 2016! Don’t forget, you can download my free 2016 Sky Calendar as a PDF. See my previous blog for details and the link. Comet Catalina sports two tails as it moves past Venus in the dawn sky. This was the view this morning, December 9, from my site in Arizona, of Comet Catalina near Venus in the dawn sky. This is a telephoto lens shot that provides a view similar in size to what binoculars show. However, the blue ion tail visible here stretching back several degrees is mostly a photographic target. Visually, just Catalina’s short, stubby dust tail at lower right is obvious. The ion tail points away from the Sun, while the dust tail extends along the comet’s orbit, showing where the comet has been. The view, both visually and photographically, of the comet will improve as it climbs higher into the eastern morning sky and as it moves away from the glare of Venus. The Moon is also now gone from the dawn, at least for the next couple of weeks. The comet is dimmer than expected but should at least maintain this brightness for the next month or so. This is a stack of 5 x 90-second exposures, taken with the 135mm telephoto and 1.4x extender for a focal length of 190mm, at f/2.8 and with the Canon 5D MkII at ISO 1600, tracked on the iOptron Sky-Tracker. Two other exposures, of 15s and 1s, were blended in with luminosity masks to reduce the glare of Venus to a smaller size. I got the comet but it isn’t what was hoped for – a faint fuzzball in binoculars. This was Comet Catalina (aka C/2013 US10) in the dawn sky this morning, December 6, with the comet appearing as a fuzzy star below brilliant Venus in binoculars, and just revealing its two short tails in photos. It’s the cyan-colored object near the centre. Venus is the brilliant object. This image is with a telephoto lens, and covers a little more of the sky than typical binoculars would show. I knew this would be a binocular comet at best, but it’s barely that. This is more a comet for telescopes. The arch of the Milky Way in the northern autumn and early winter sky, from Arizona on December 5, 2015. The Milky Way extends from Aquila to the left, in the southwest to Cassiopeia at top right, to Perseus and Auriga at far right, in the northeast. I shot this from the Quailway Cottage near Portal, Arizona, latitude +32° N. The view is looking north toward the celestial pole. Polaris is just right of lower centre. This is a stack of 8 tracked exposures, each 3 minutes at f/2.8 with the 15mm lens and Canon 6D at ISO 1600, with the ground coming from one exposure to minimize blurring. The camera was on the iOptron Sky-Tracker. Orion and the northern winter constellations and Milky Way setting at dawn over the Chiricahua Mountains of southwest Arizona, near Portal, AZ. The waning crescent Moon in the west provided the illumination in this dawn shot from December 6, 2015. Orion is just above the main peak at centre, with Sirius, in Canis Major, to the left and Aldebaran, in Taurus, to the right. The Pleiades are setting at right. The star cluster at top is the Beehive, M44, in Cancer. Bands of airglow add the red streaks. The site is the Quailway Cottage near Portal, Arizona. This is a stack of 4 x 2 minute exposures, tracked, at f/3.5 with the 15mm full-frame fish-eye lens and Canon 6D at ISO 1250, for the sky, and the same specs for 4 exposures, untracked for the ground. Each set was mean-combined stacked to reduce noise. This was the winter Milky Way with Orion setting into the west over the Chiricahuas at dawn. Turn around from looking at the comet and this was the view. So who cares if the comet isn’t too great? There’s lots more to see and shoot. With no snow, no frost, no dew. More to come this week I trust! A new comet is coming into our morning sky, for our binocular viewing pleasure. Comet Catalina, aka C/2013 US10, has emerged from behind the Sun and is beginning to rise into our northern hemisphere dawn sky. The new comet promises to be visible in binoculars, but likely won’t be obvious to the unaided eyes. On the morning of December 7 the comet sits within a binocular field of the waning crescent Moon which itself sits just above brilliant Venus. That in itself will be a remarkable view, best appreciated in binoculars, and a fine photogenic sight for the camera. The close conjunction of the crescent Moon with Venus alone will be enough of an attraction on December 7, but the comet should add to the scene. Even more, later in the day the Moon actually passes in front of, or “occults,” Venus in the daytime sky for most of North America. That occultation happens in the morning for western North America and in the early afternoon for eastern North America. However, you’ll need a telescope to see it well, and very clear blue skies. Use planetarium software (the free Stellarium program, for example, shown above, if you do not own astronomy software) to simulate the sky and provide the occultation times for your location. Zoom into the Moon and run time back and forth on December 7 to see when Venus goes behind the Moon and reappears. The screen shot above is for Calgary. Comet Catalina was discovered in October 2013 at the Catalina Observatory in Arizona. The comet spent the last few months in the southern hemisphere sky, but is now coming north and into our sky, but at dawn. It rises higher and higher each morning through December and into the new year. It may remain at fifth magnitude, bright enough to be easily visible in binoculars from a dark site, but likely not naked eye. The chart above plots the comet at daily intervals, from December 4 to January 1. 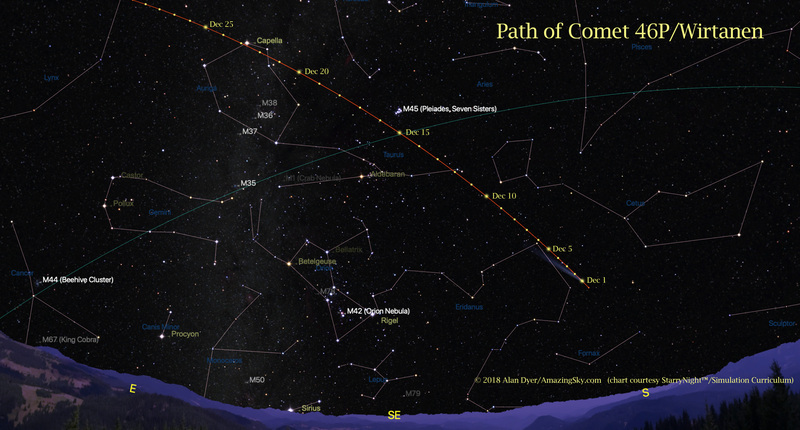 The comet is shown for December 15. Note that on the morning of January 1 it sits within a telescope field of the bright star Arcturus. 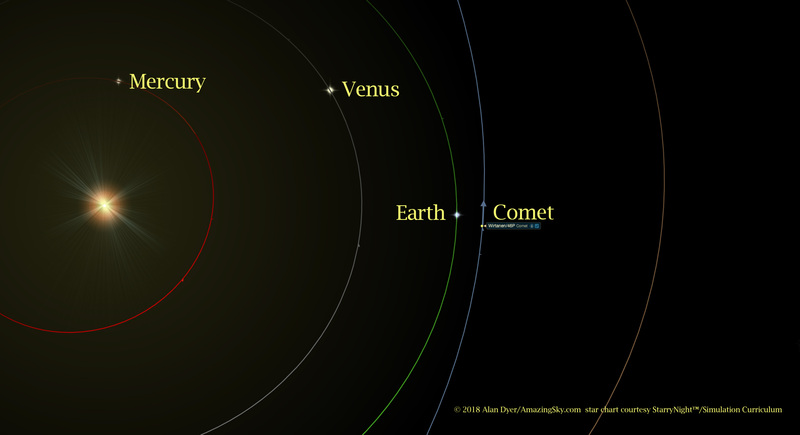 The distance from Earth to the comet decreases through December and early January, keeping the comet at a constant brightness even as it recedes from the Sun. We are closest to Catalina on January 17, at a far distance of 108 million km. But in late January the comet fades rapidly to become a telescope target. To see Comet Catalina this month, get up 1 to 2 hours before sunrise and look southeast to east. But you will need dark skies to see it well. This will not be a good urban comet. Nevertheless, as far as we know, this will be the best comet of 2016. 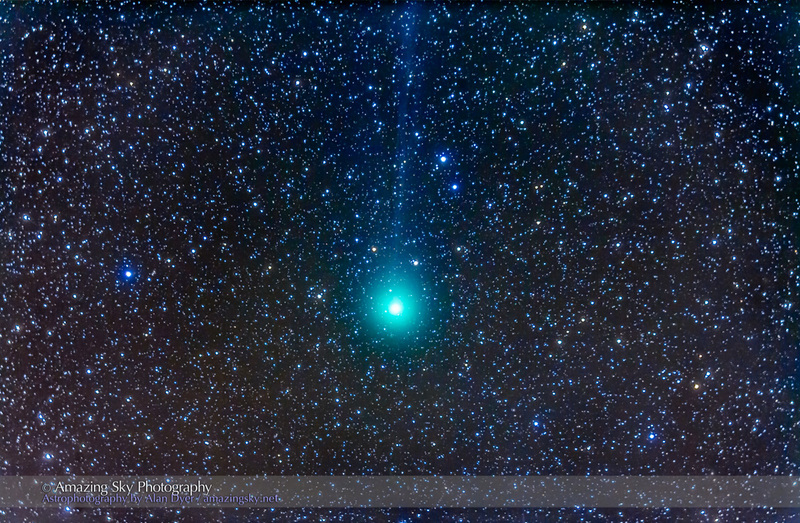 Tonight I caught a close-up of the green head and blue tail of Comet Lovejoy. Clear skies tonight, Tuesday, January 6, allowed me to shoot Comet Lovejoy from home using a telescope and guiding system for a close-up view. I had just over half an hour of darkness between end of twilight at 6:30 and moonrise at 7:15 but that’s all I needed to grab several guided exposures. This telescopic shot takes in a field of about 5 by 3 degrees, a little smaller than what most binoculars would show. The image is a stack of four 2-minute exposures with the telescope guiding on the fast-moving comet. Comet Lovejoy is now at its closest point to Earth and moving fairly rapidly across the sky. So I guided on the comet, letting the stars trail slightly over the 8 minutes of exposure time. The head of the comet glows bright green in photos, from glowing diatomic carbon, while the tail glows blue from other ionized gases streaming away from the head, or coma. The source of it all is a tiny icy nucleus completely hidden from view amid the glowing gases. Comet Lovejoy was easy in binoculars, which showed a bare hint of the tail in dark skies. I could see the comet naked eye, but only by knowing just where to look. It appeared as a slightly fuzzy star, but unless you knew what you were looking at you wouldn’t know it was comet. This is a binocular comet for dark skies. But a very nice binocular comet. Comet Lovejoy has migrated from the southern sky to appear in our northern sky for the holiday season. 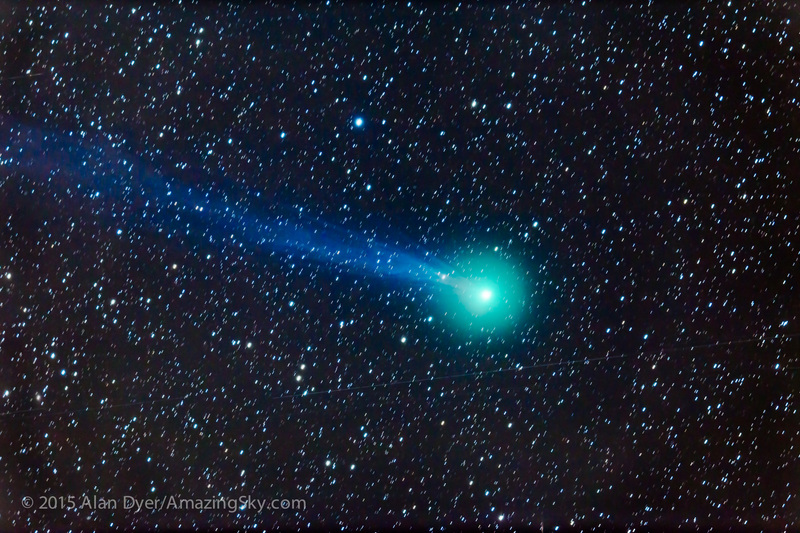 This was Comet Lovejoy, aka C/2014 Q2, as it appeared on Tuesday night, December 23. It was low in the south well below Orion in the constellation of Columba the dove. It was easy to see in binoculars as a 5th magnitude fuzzy star. My long exposure photo reveals its thin blue ion tail. I could just see the comet naked eye, knowing exactly where to look. However, I’m at 32° North latitude, placing the comet now decently high in my New Mexico sky. The comet was discovered by Australian amateur astronomer Terry Lovejoy last August when the comet was way down under in the southern sky. But it is now moving rapidly north and brightening, bringing northern observers a binocular comet for the holidays. However, the Moon is now coming up and will interfere with viewing later in the week. However, in mid-January Comet Lovejoy will be very high in the sky as its moves through Taurus, with the Moon out of the way. By then the comet may be brighter and a naked eye object from dark sites. But don’t expect it to be anything more than a fuzzy star. This comet never gets close to the Sun, so isn’t likely to grow a bright dust tail. For more details see the SkyNews magazine web page.